Liveable communities champion and City Councillor Geoff Meggs has tabled a sharply worded motion for discussion at the upcoming City Hall Council chamber session on January 17th. 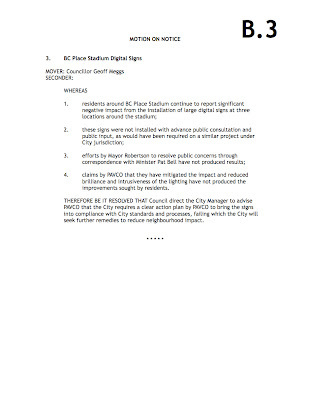 In the motion document posted on the City website (see ‘Motions on Notice’ at http://vancouver.ca/ctyclerk/cclerk/20120117/regu20120117ag.htm), Meggs outlines the various discussion items to be addressed regarding the BC Place Stadium Digital Signs, items which could not be less embarrassing and exposing for BC PavCo CEO Warren Buckley and his team. Among the shameful items to be reviewed is the categoric rebuttal of recent PavCo propaganda suggesting that fiddling with operating hours and/or brightness has reduced the daily torment felt by residents whose glass-enclosed living rooms, dining rooms and bedrooms are facing the giant illuminated screens. 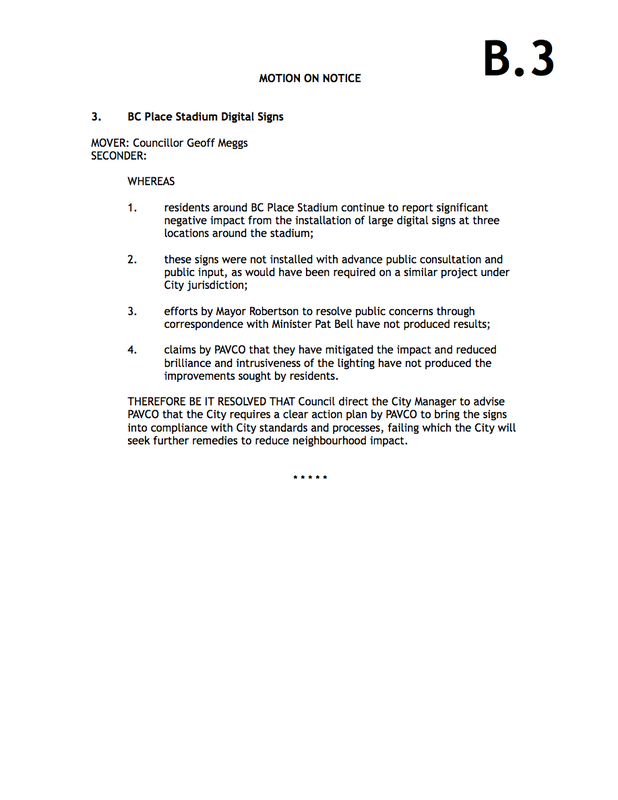 Also on the list-of-shame is the continued exposure of PavCo Minister Pat Bell’s non-collaboration with Mayor Robertson’s team, a subject on which Bell mislead the BC Legislative Assembly on November 17th, 2011. As City Hall shines an even brighter spotlight on PavCo’s demonstrated contempt regarding the hundreds of complaints continuing to flood City and Provincial officials’ inboxes, it has become clear to Vancouverites that the leadership of this Crown agency lacks the very basic respect and concern for community values that citizens expect and demand in this day and age. This late and ugly discovery about PavCo’s lack of community concern becomes particularly alarming when one realises that this Crown agency wields such great influence over the shape and infrastructural character of our great city, a city whose world-class reputation has been painstakingly built on responsible principles of liveability, sustainability and harmony with our urban environment. Next Tuesday morning promises to be an exciting chamber meeting for citizens concerned with protecting Vancouver residents’ quality of life, and a miserably painful day for disconnected officials PavCo Minister Pat Bell and CEO Warren Buckley.